on December 5, 2017, 1:02 p.m. The YouGov Omnibus study, which surveyed YouGov panellists online across 20 different countries, asked respondents - when considering what they look for in a romantic partner - would they rank personality more important than good looks or good looks more important than personality? The verdict worldwide was unanimous among women in particular with the majority of females ranking personality higher than good looks in every country. Among men however, Vietnam was the only country where good looks are considered to outshine personality in particular with 46% of Vietnamese men ranking personality as important. 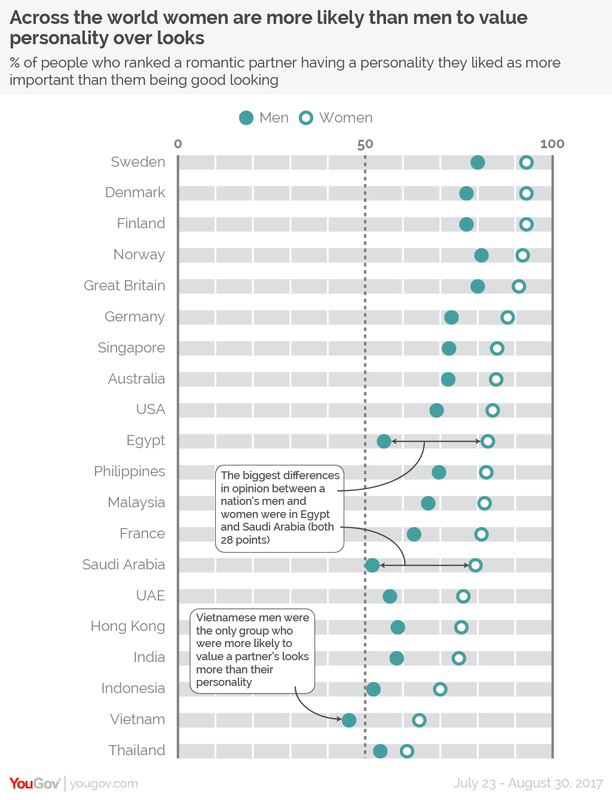 Women in Nordic countries were the most likely choose personality over good looks globally, compared to those in Asian countries such as Indonesia, Vietnam and Thailand who were the least likely to agree. The study found that the biggest differences in opinion between the world’s men and women on the topic were in Egypt and Saudi Arabia. 55% of Egyptian men rank personality more important than looks compared to 83% of women, while 52% of Saudi men rank personality higher than looks compared to 79% of women. In the UAE, 76% of women ranked personality higher than good looks, compared to 47% of men. The study also asked respondents to prioritise the importance of six different attributes in a romantic partner according to their personal preferences. As expected, having ‘a personality I like’ was the most imperative attribute, prioritised in first or second place by the majority of men and women, and favoured the most by women in all three counties. However, that is where the similarities end between the two genders. For men in the UAE, Saudi Arabia and Egypt the top three characteristics they look for the most in a romantic partner doesn’t change. Behind personality, good looks and intelligence are the next most highly prioritised attributes respectively among male respondents across the board. However, the results show women are more particular and their preferences change between the three countries. After personality, in the UAE a sense of humour is the next most important characteristic to look for in a romantic partner, followed by intelligence. Egyptian women favour intelligence the most, with similar interests ranked third. For Saudi women it is the reverse, they prioritise similar interests the most, followed by intelligence. All of the surveys were conducted online by YouGov Omnibus, and in many of the countries the internet penetration is low to the point where the sample can only be said to be representative of the online population. The countries where the online population is lower than 60% of the total are Egypt, India, Indonesia, Philippines, Saudi Arabia, Thailand and Vietnam. Data was collected among 1,002 residents in the UAE and Egypt respectively and 1,000 residents in Saudi Arabia between 2 – 16 August 2017. Data is broadly representative of the adult online population in all three countries.